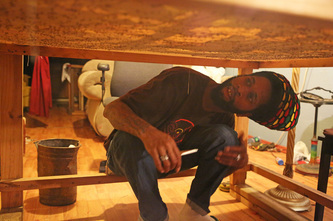 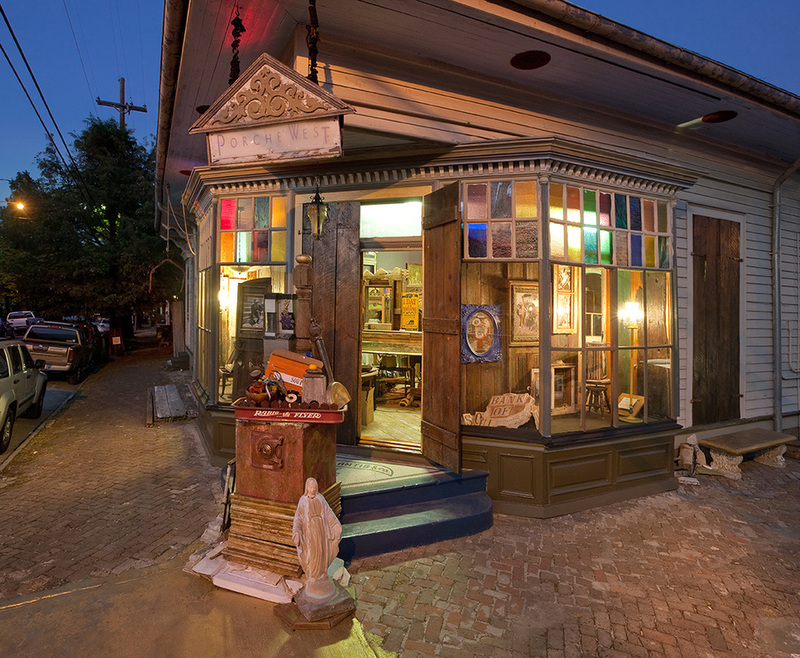 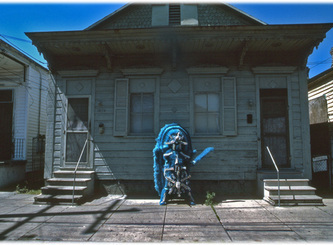 Back somewhere very deep in a New Orleans neighborhood a man hunches over canvas stretched on a rough wooden frame. 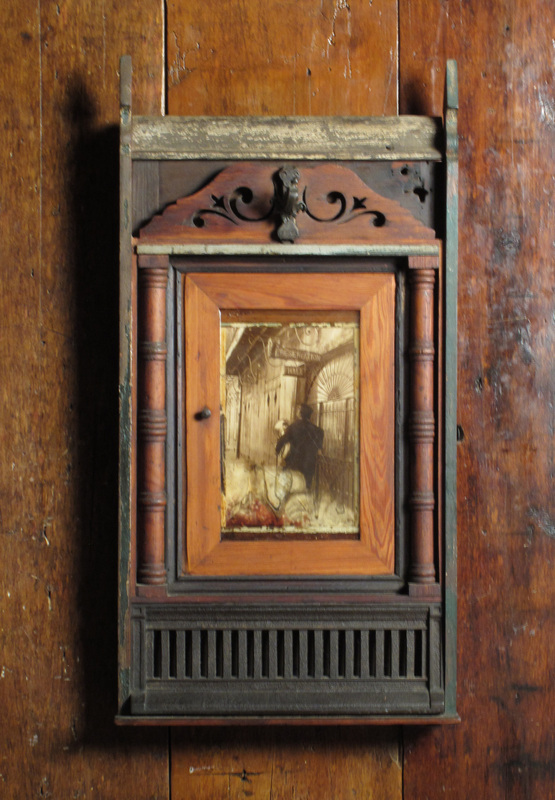 A cheap gooseneck lamp focuses a circle of light on a small area of the canvas, illuminating penciled lines which only he understands. 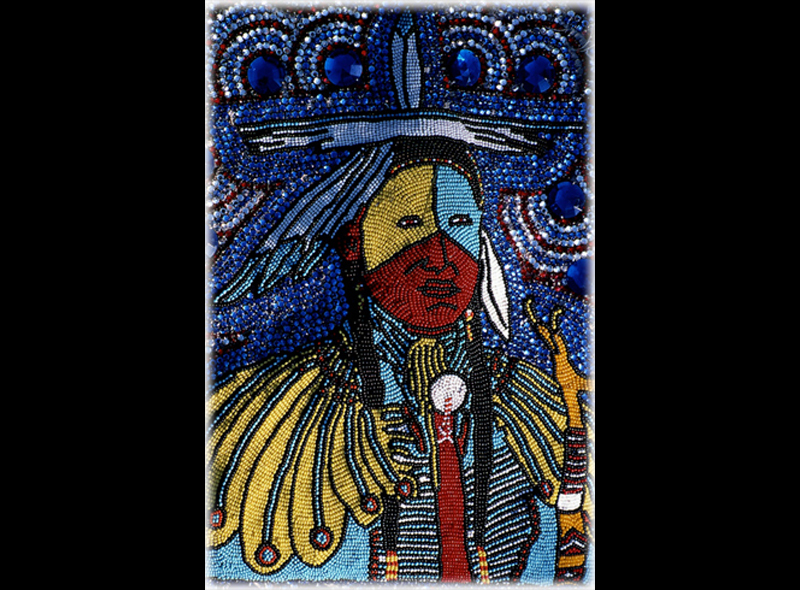 His knowing fingers are busy pushing needle and thread through the canvas to attach tiny chalk beads. Within easy reach are thousands of beads in dozens of colors, handy for his selection. 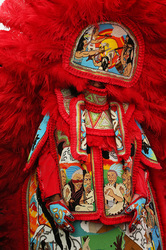 Beads are strung, sewn point to point in the design outline and then fixed with minute stitches across the string. 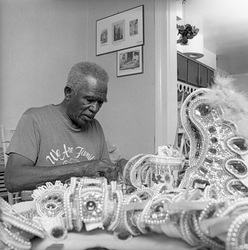 The work is tedious. 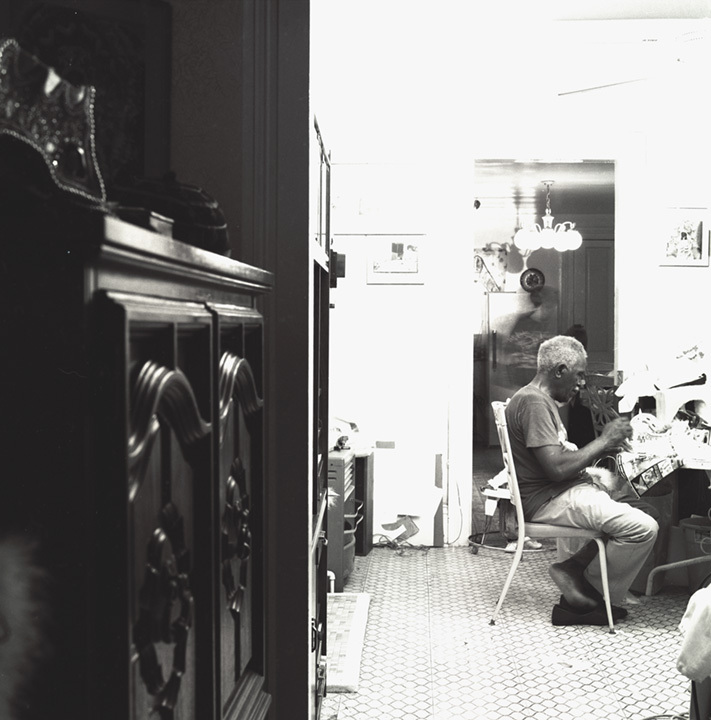 It's later than he wants to think about. 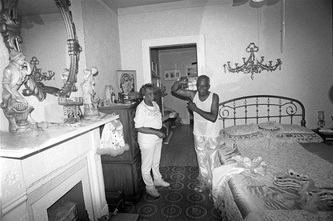 Everybody's gone to bed. 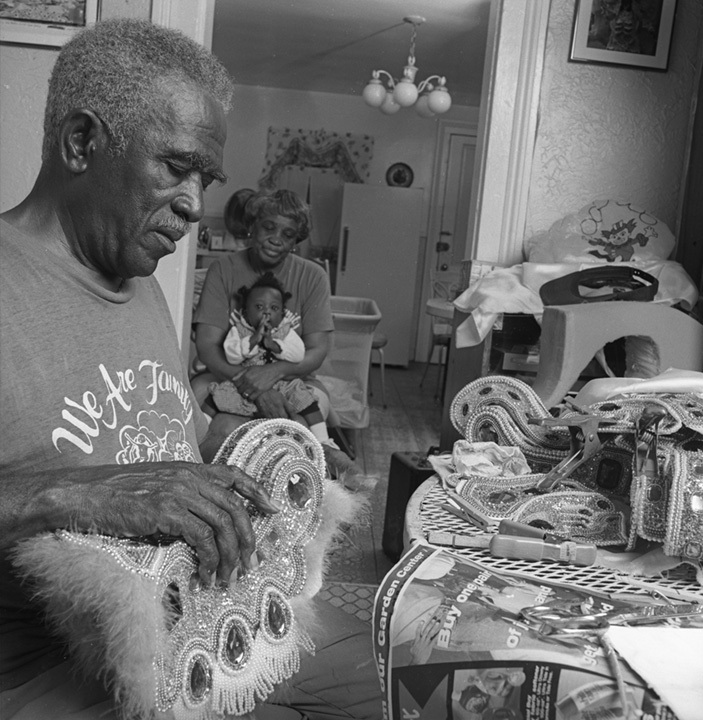 But, he's got to sew. 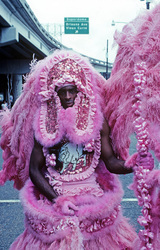 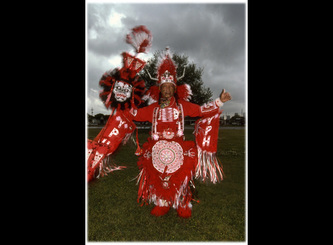 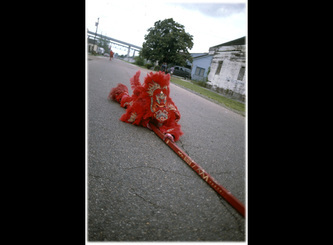 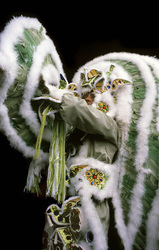 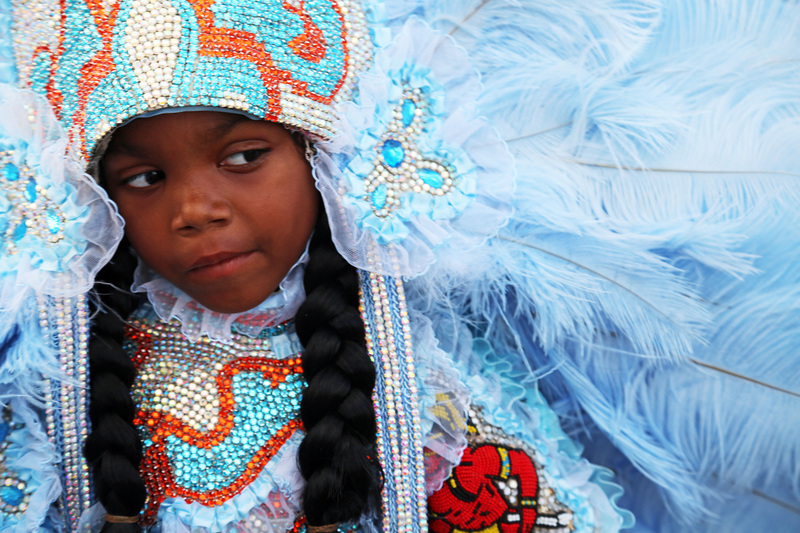 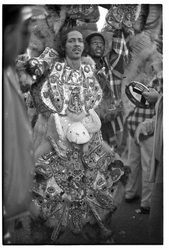 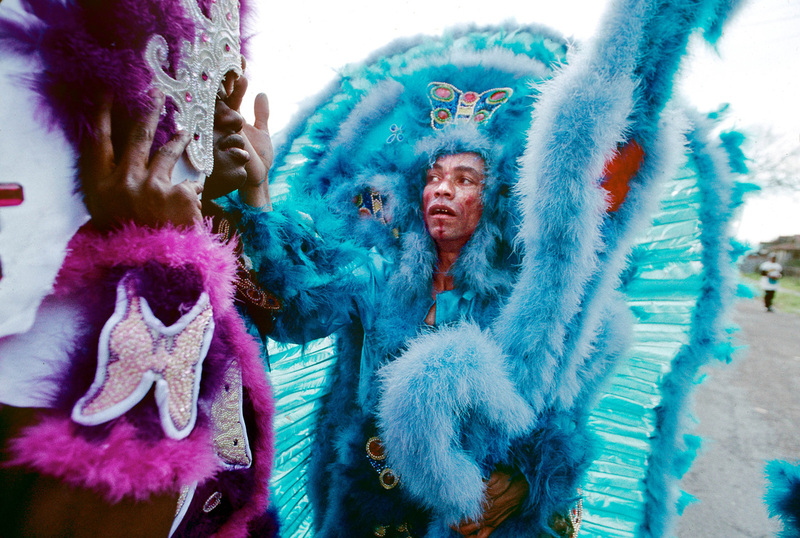 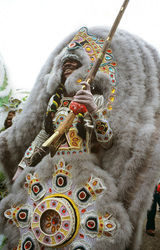 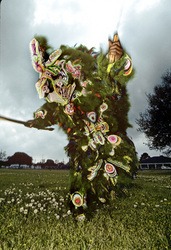 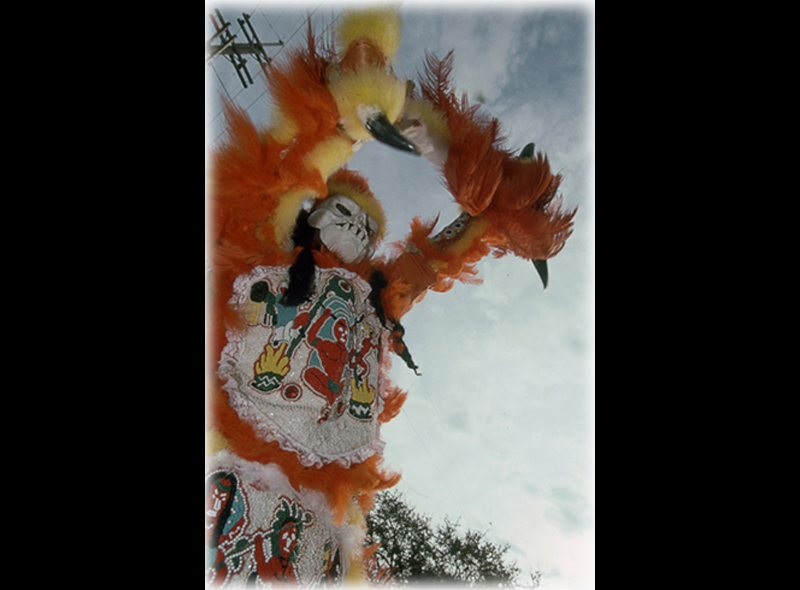 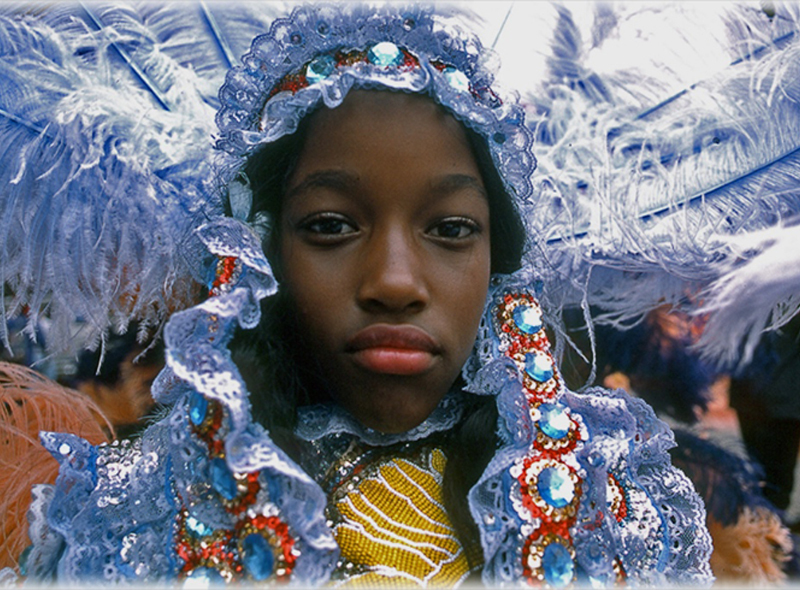 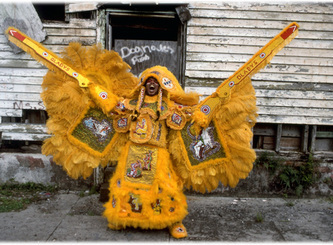 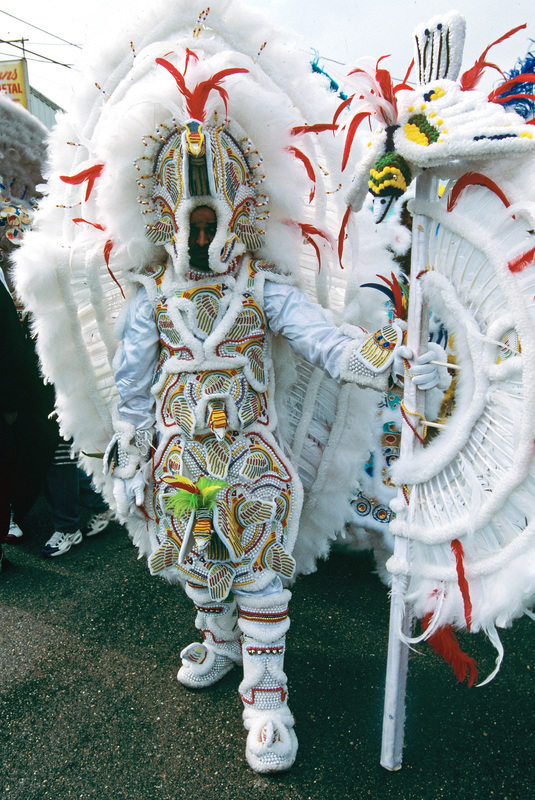 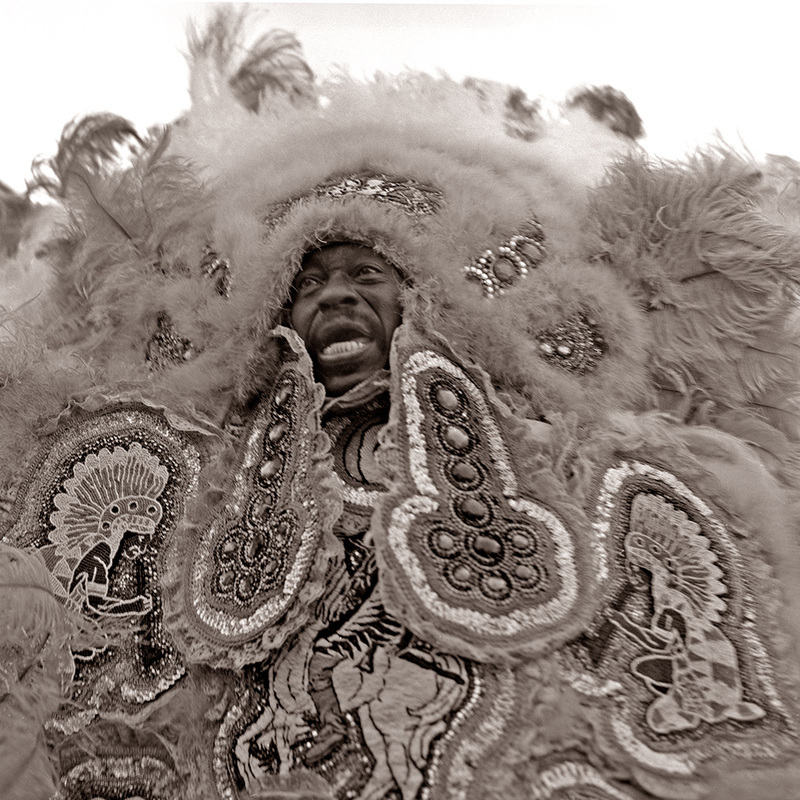 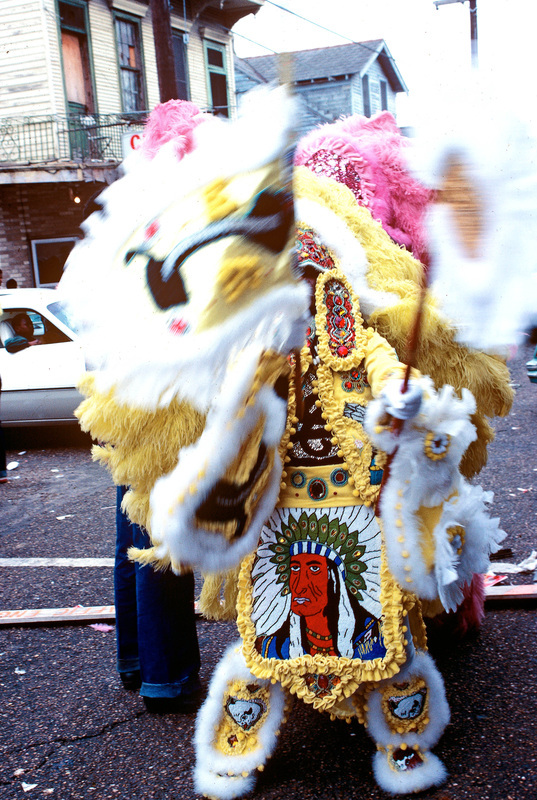 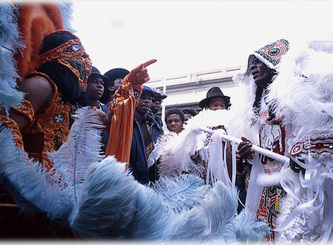 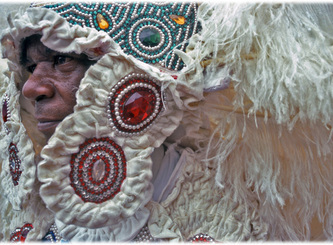 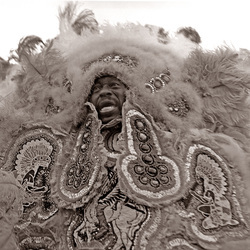 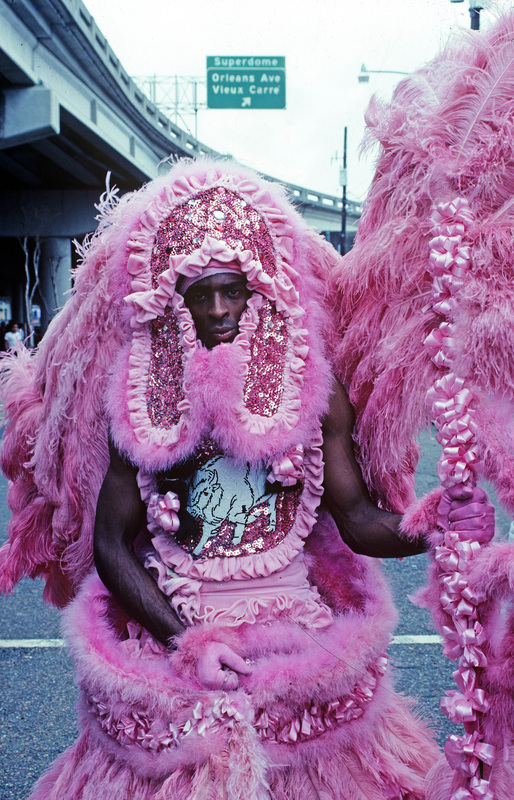 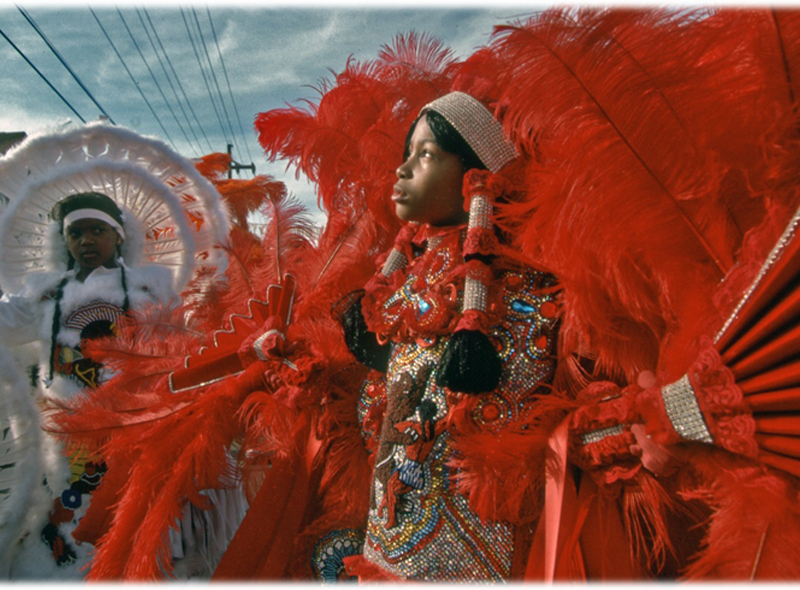 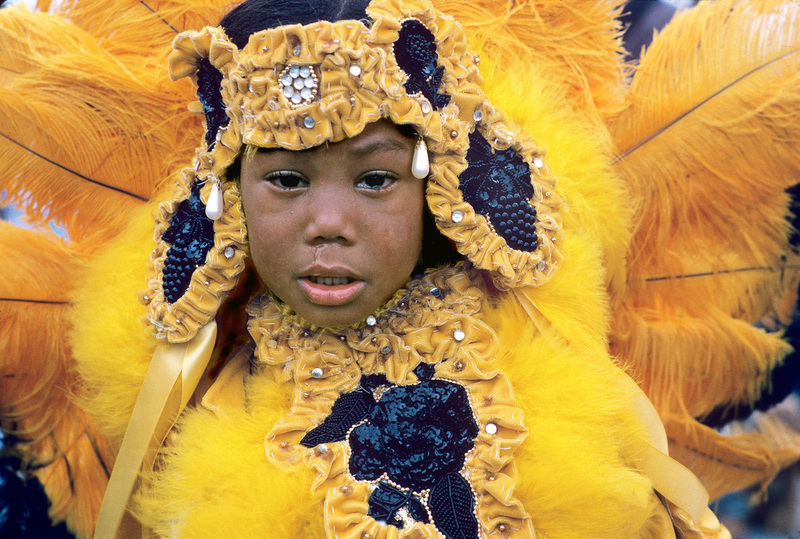 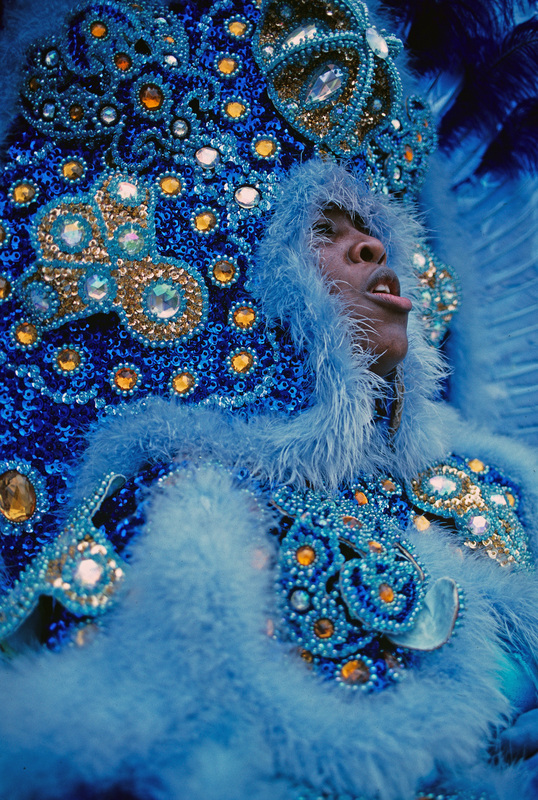 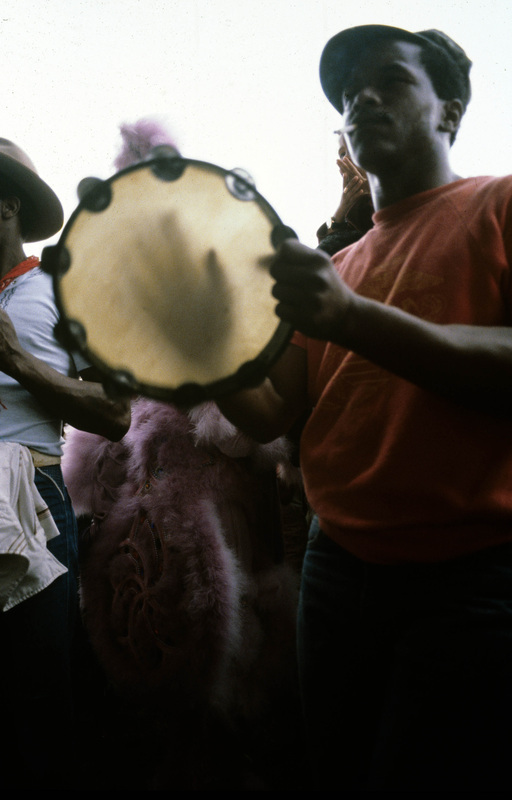 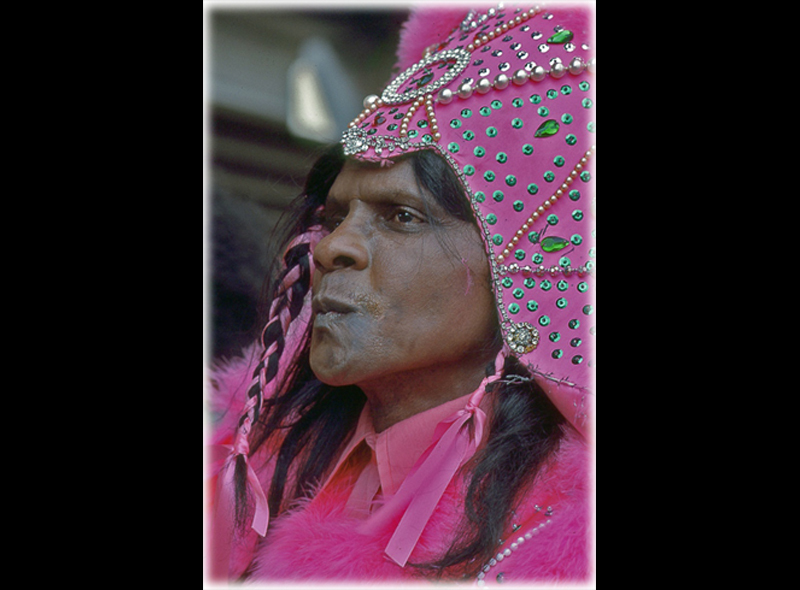 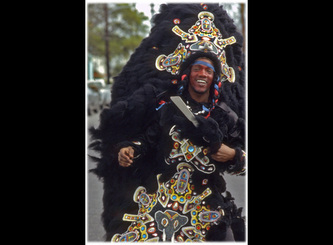 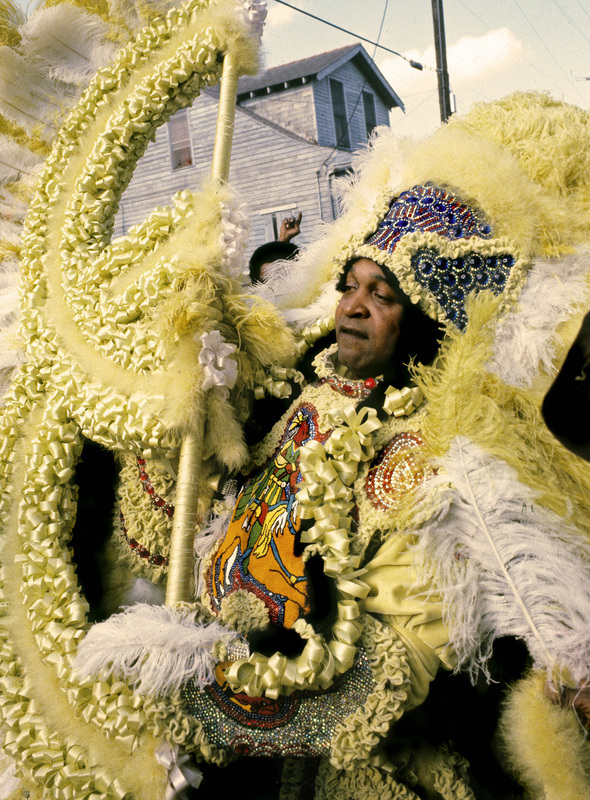 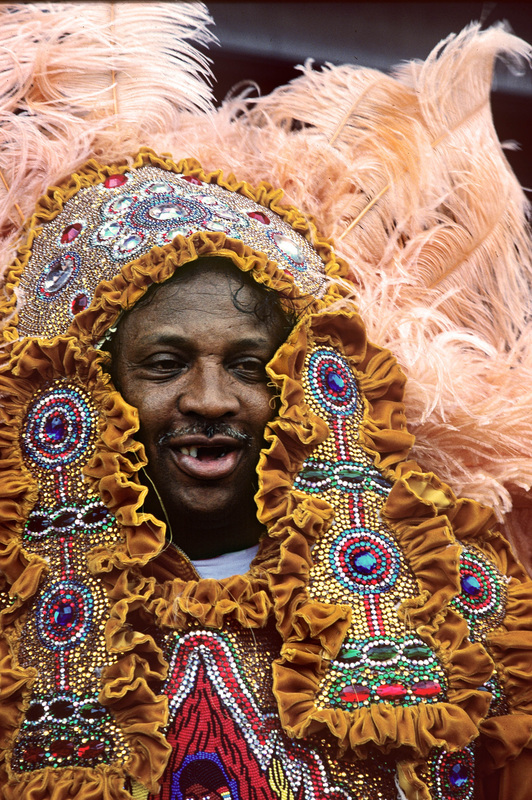 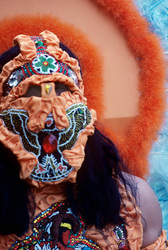 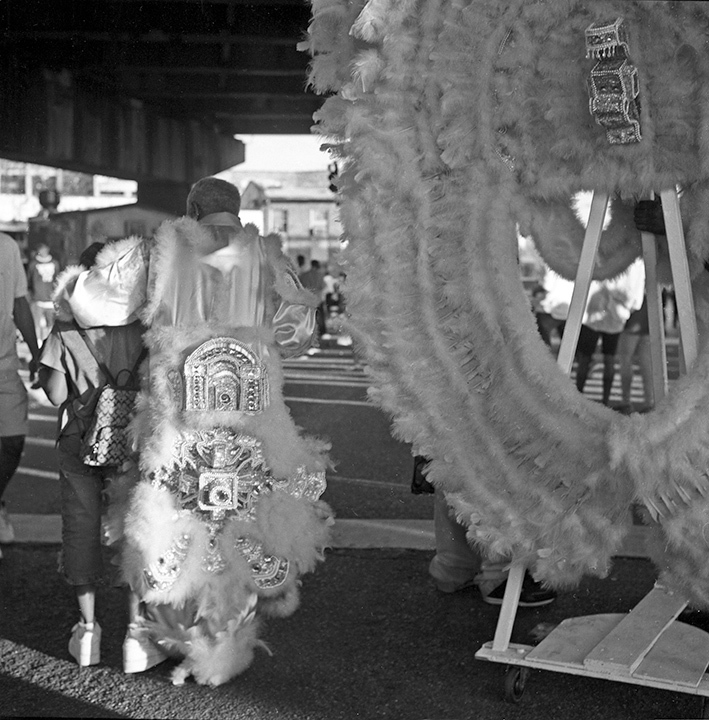 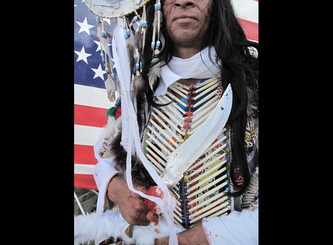 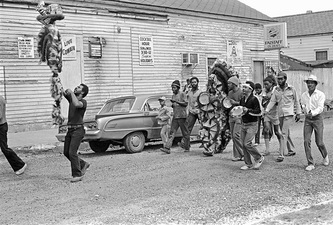 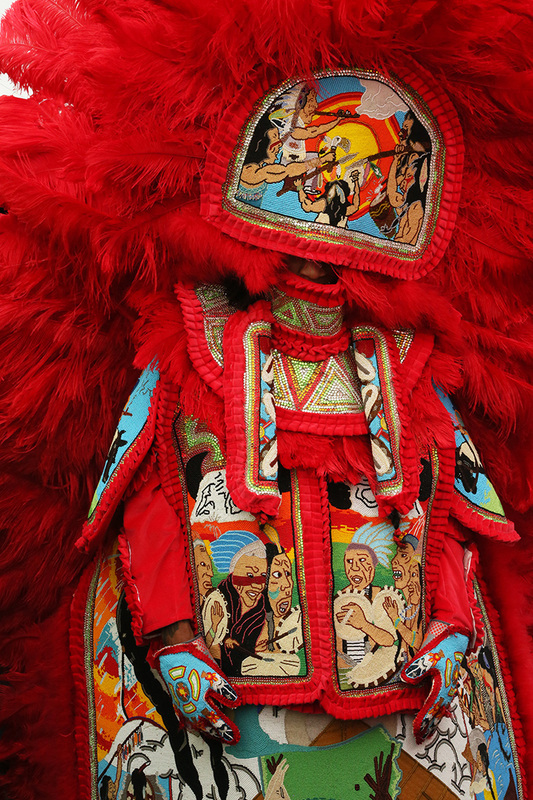 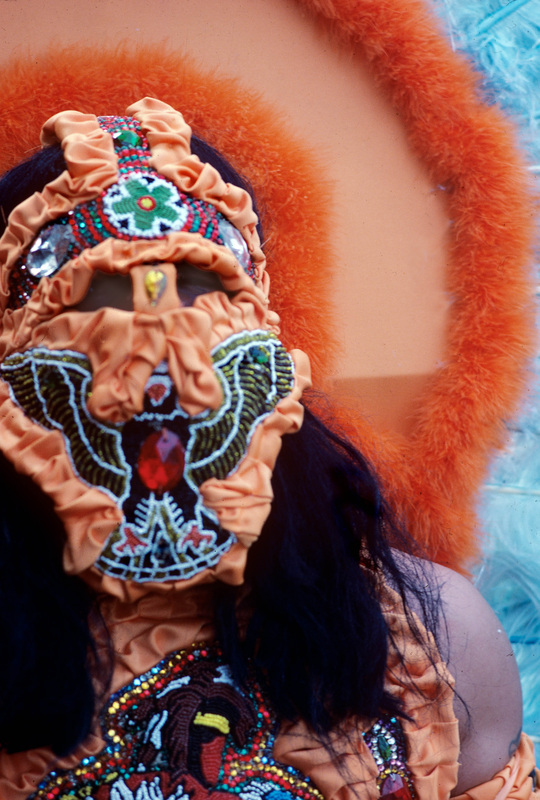 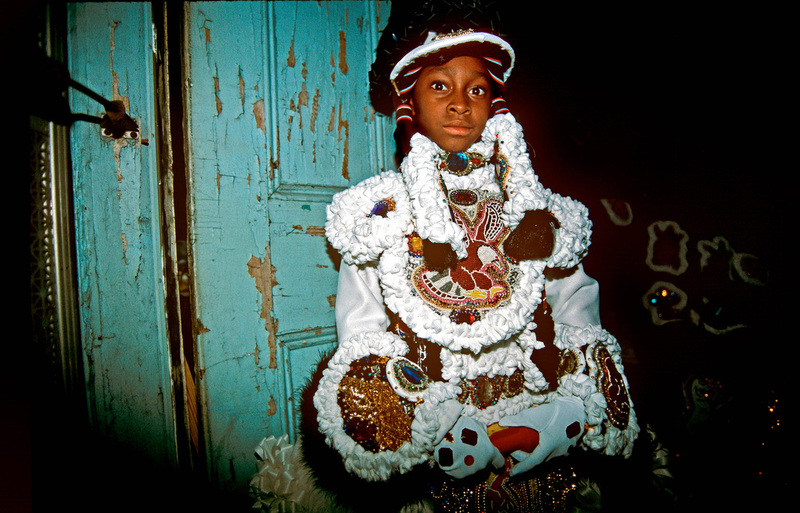 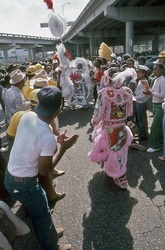 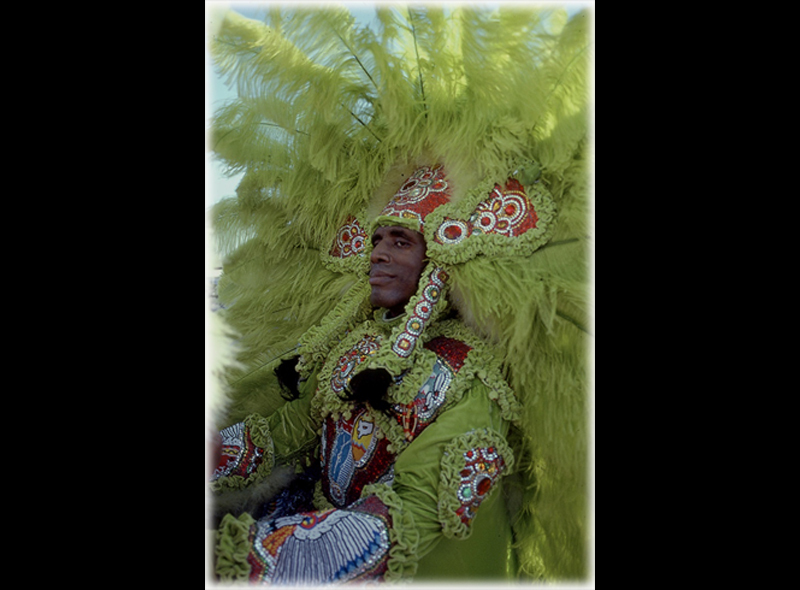 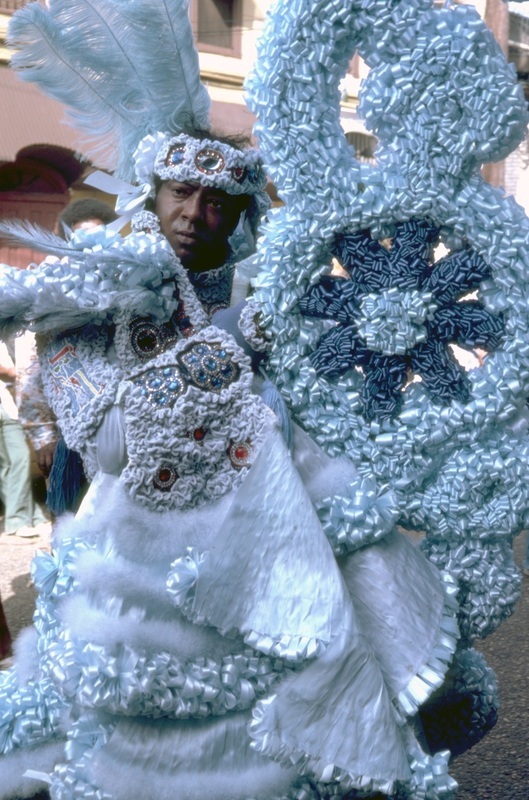 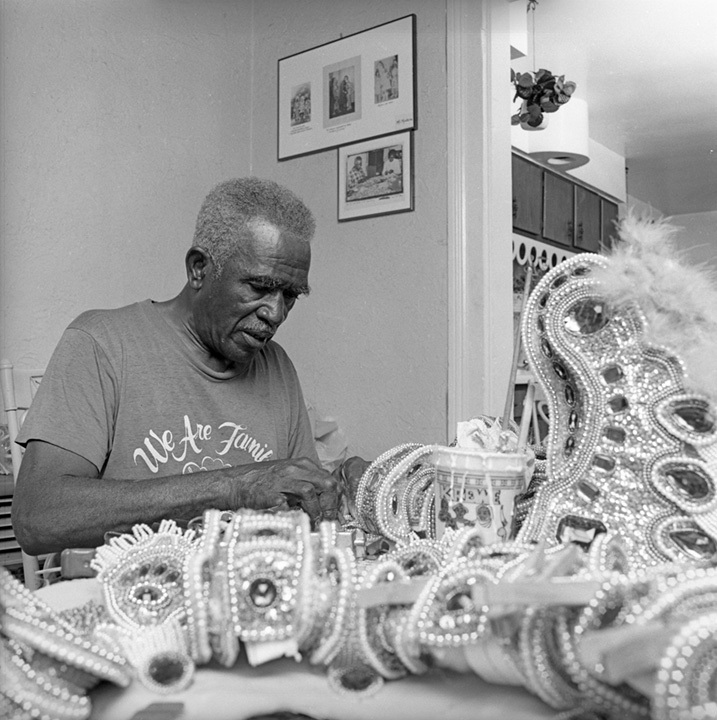 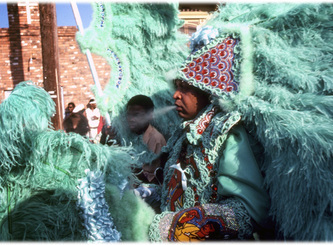 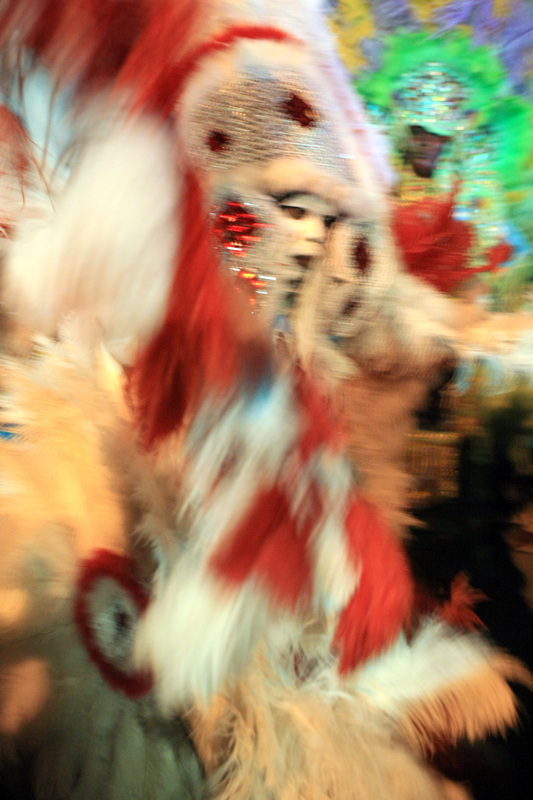 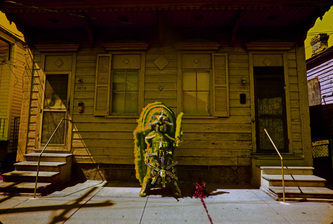 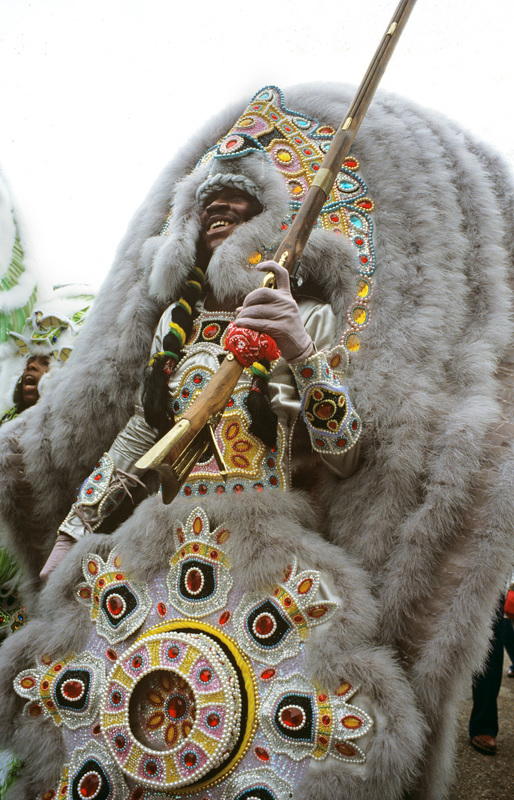 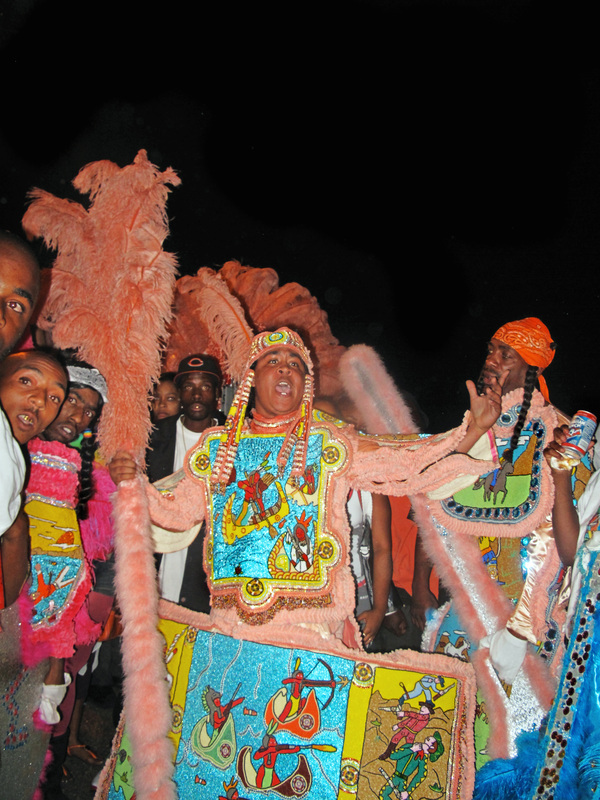 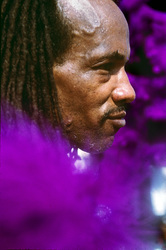 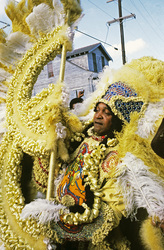 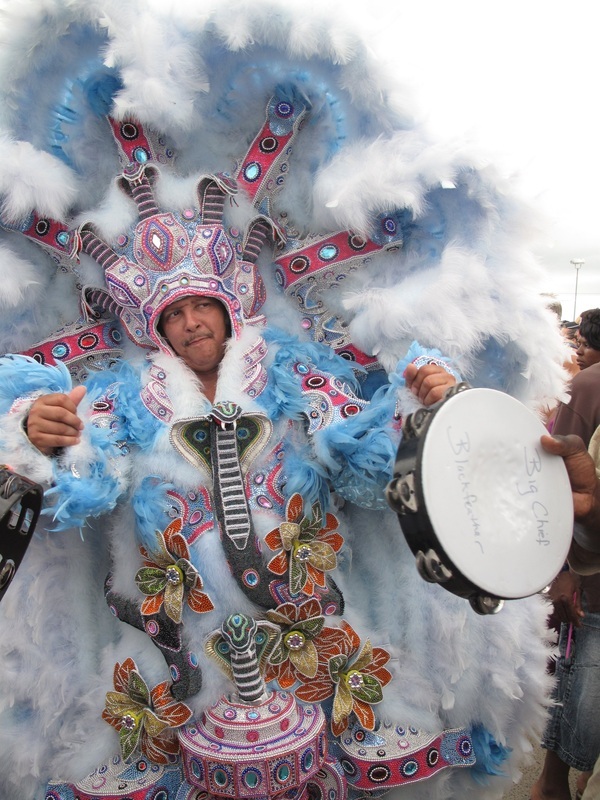 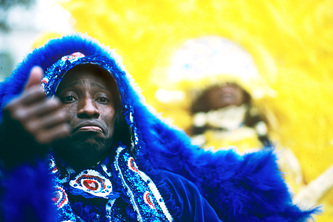 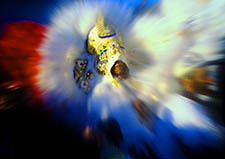 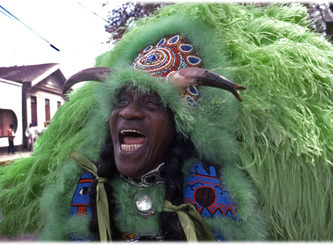 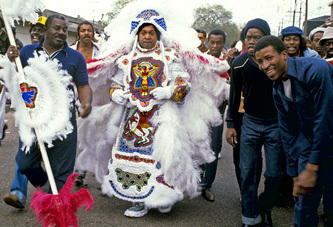 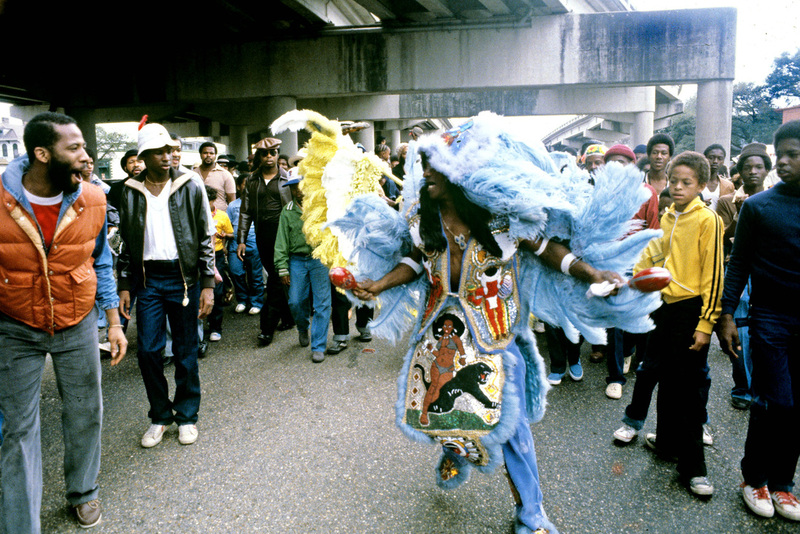 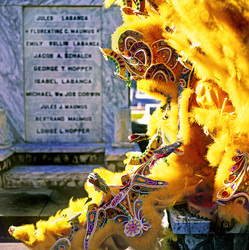 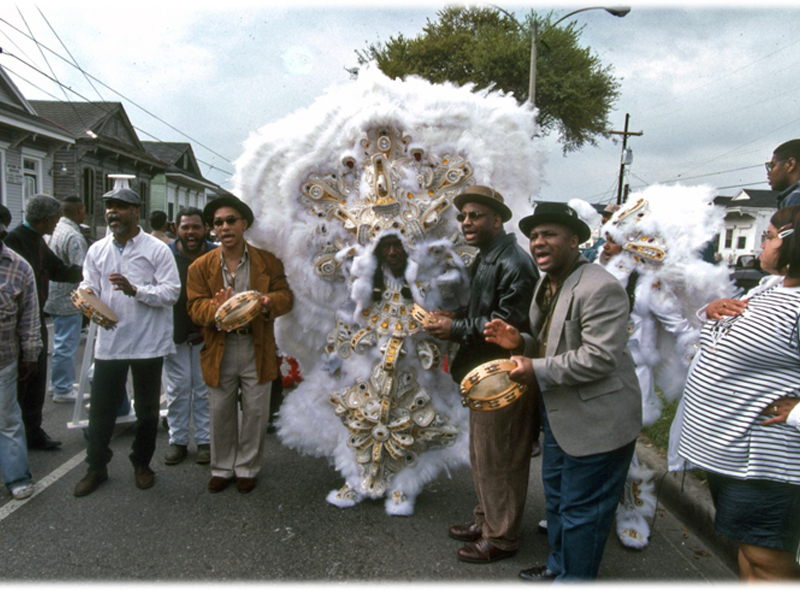 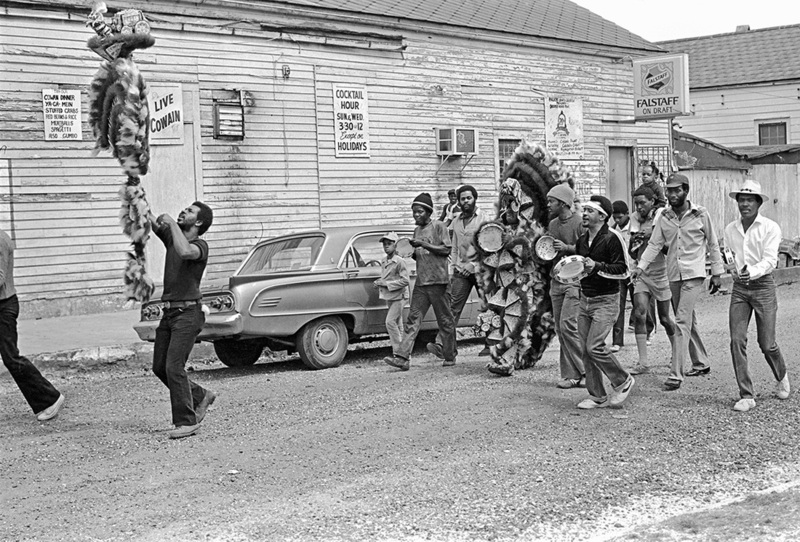 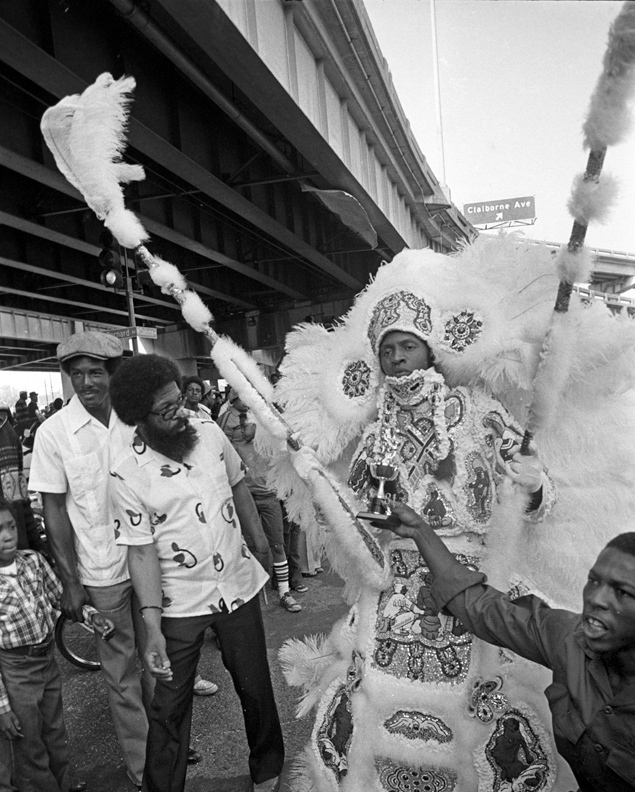 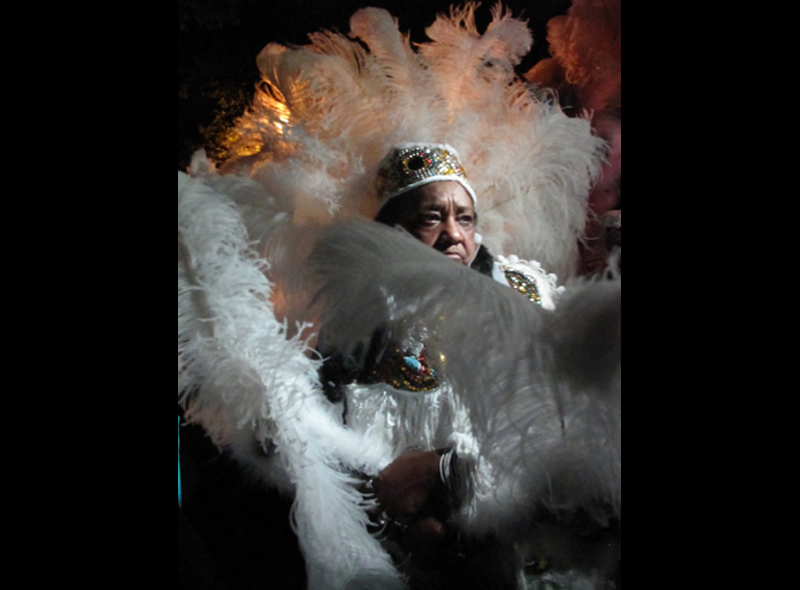 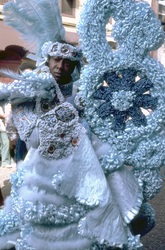 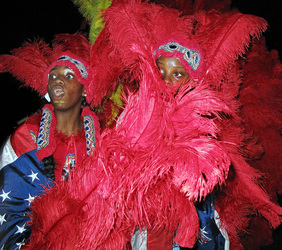 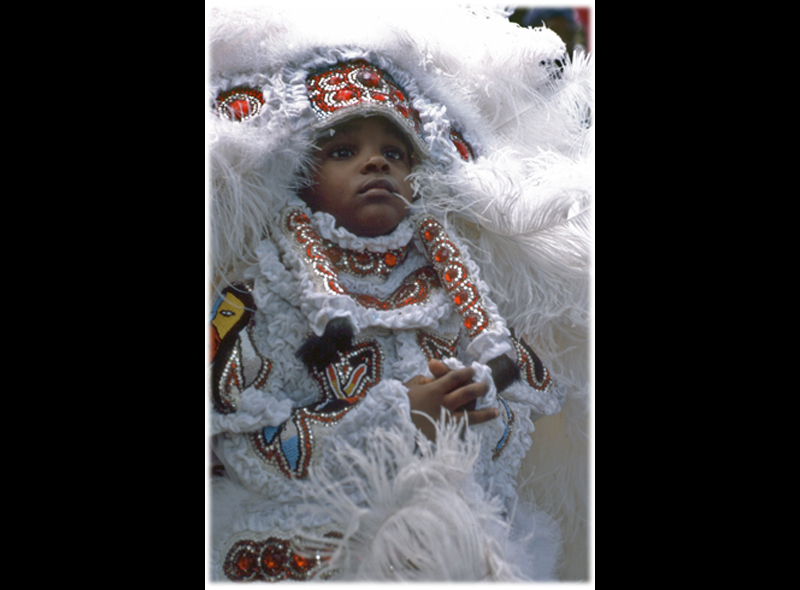 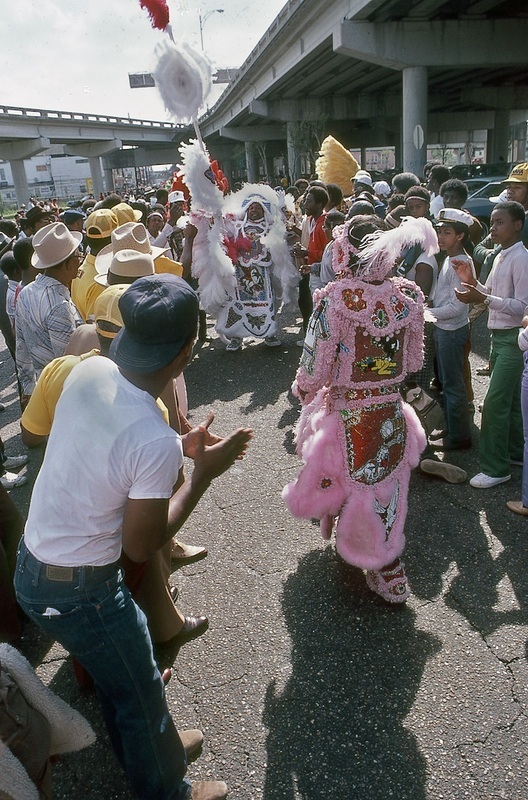 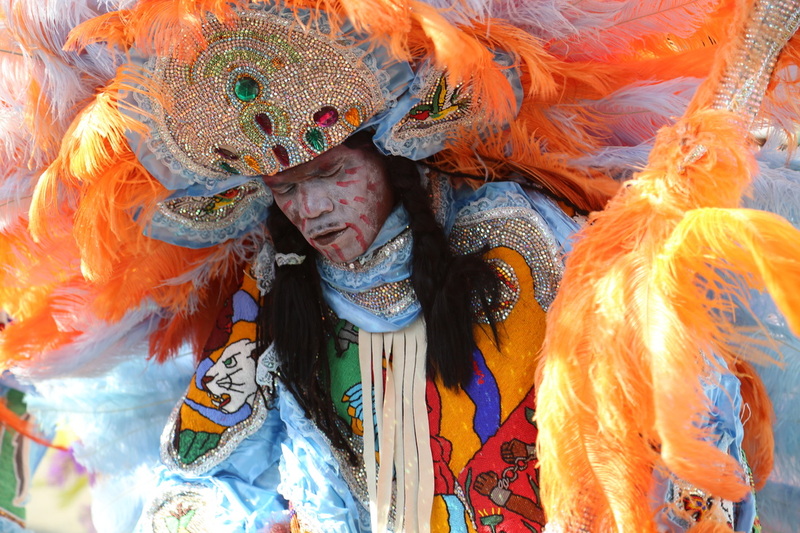 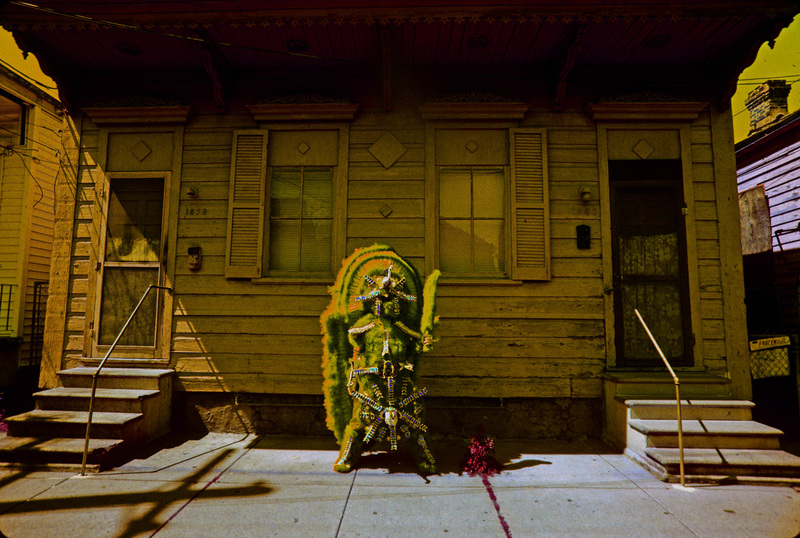 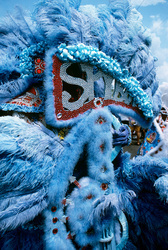 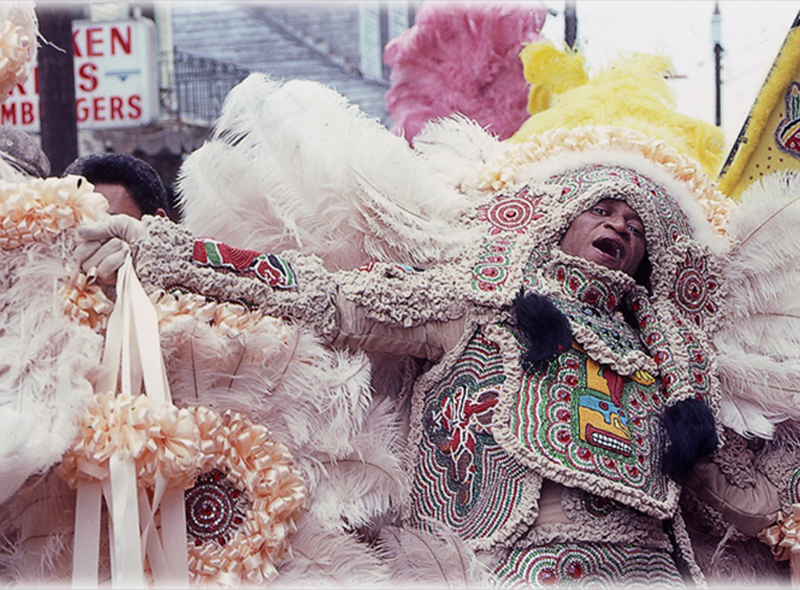 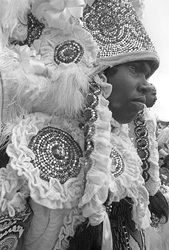 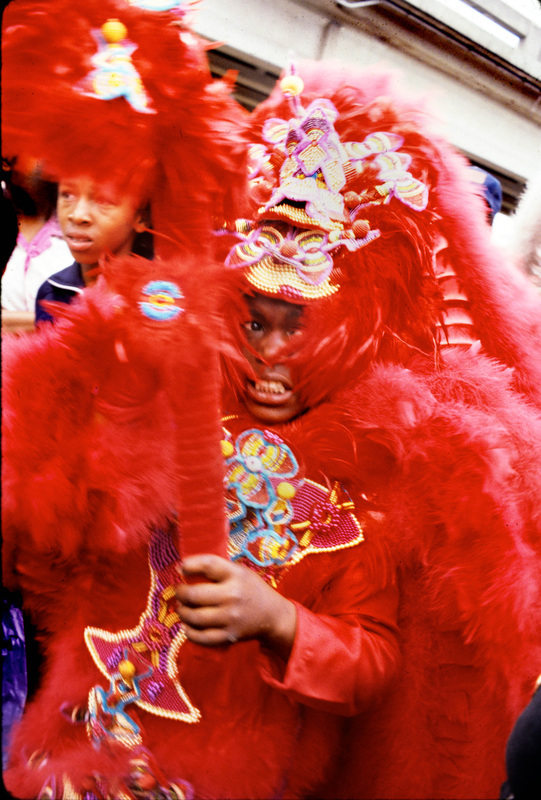 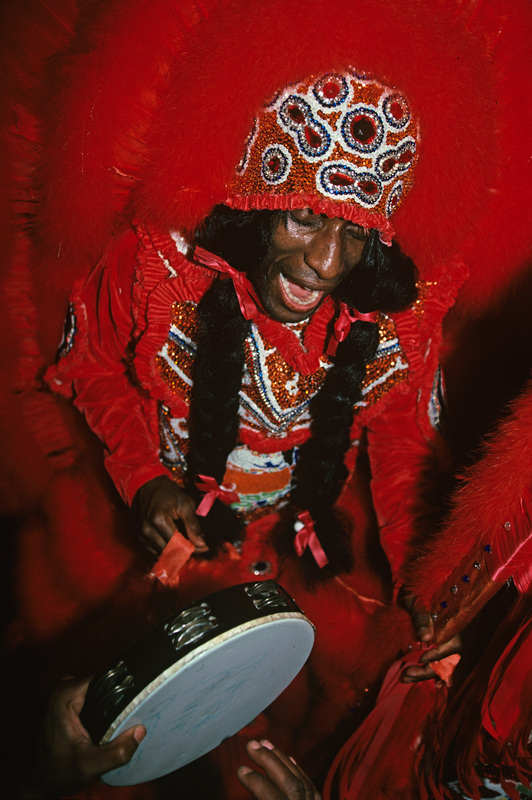 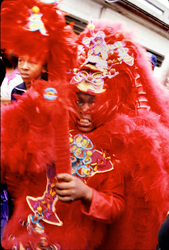 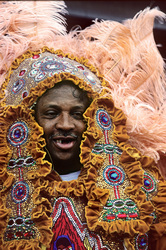 This man is a Black Mardi Gras Indian. 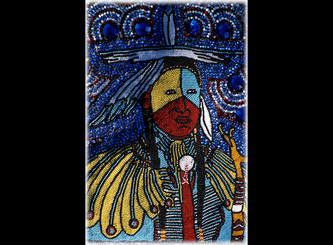 He's creating a beaded picture patch that will be one of many pictures on his "suit" this year. 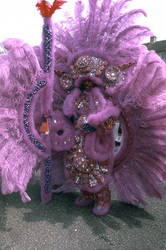 In his mind he can see the whole suit---what he'll look like coming down the street on Mardi Gras. 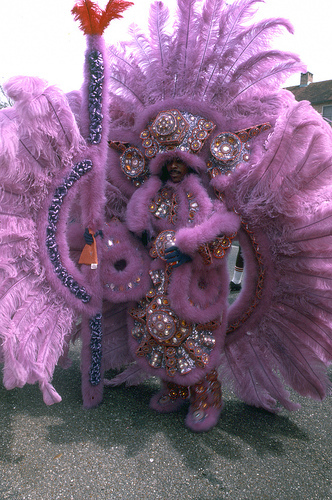 He knows the color of his suit, what story will be told in each patch, how his ribbons and ruffles will be placed, and how the plumes, feathers, marabou and fluff will float around him. 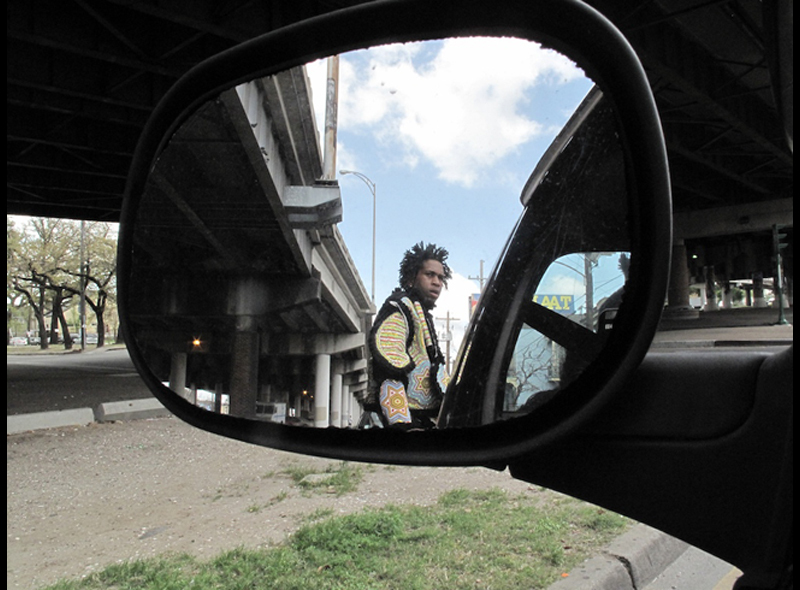 He'll be pretty, all right. 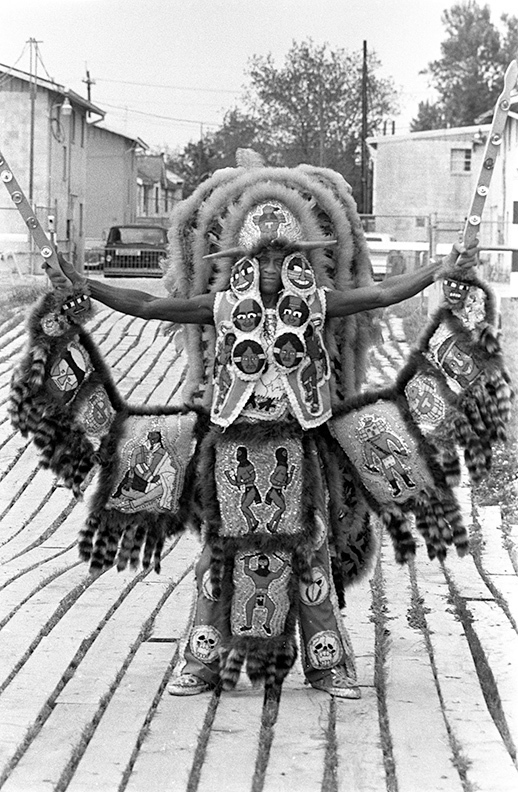 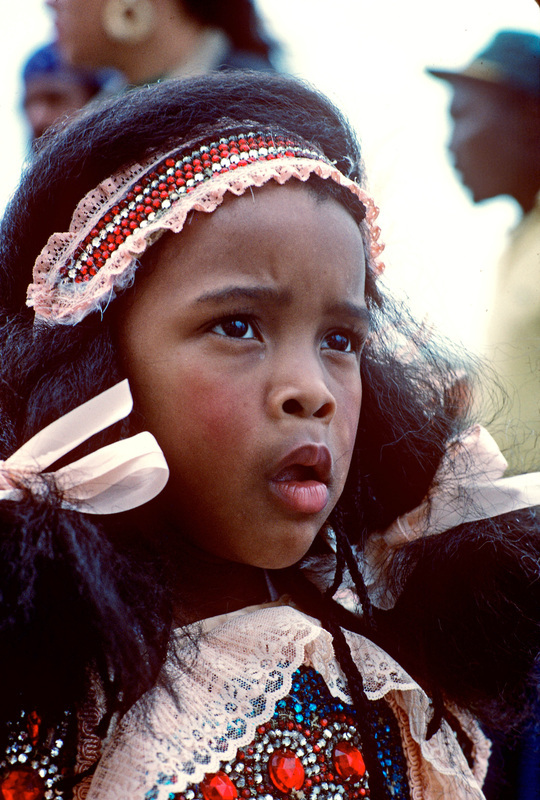 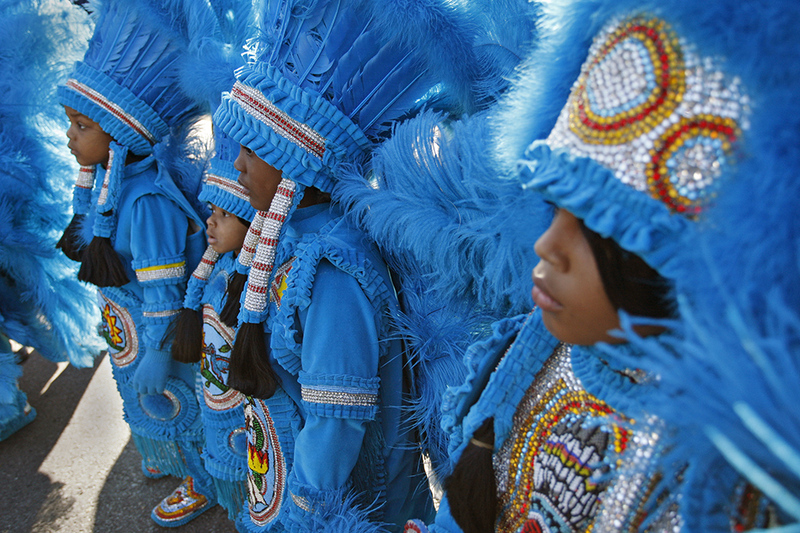 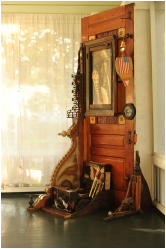 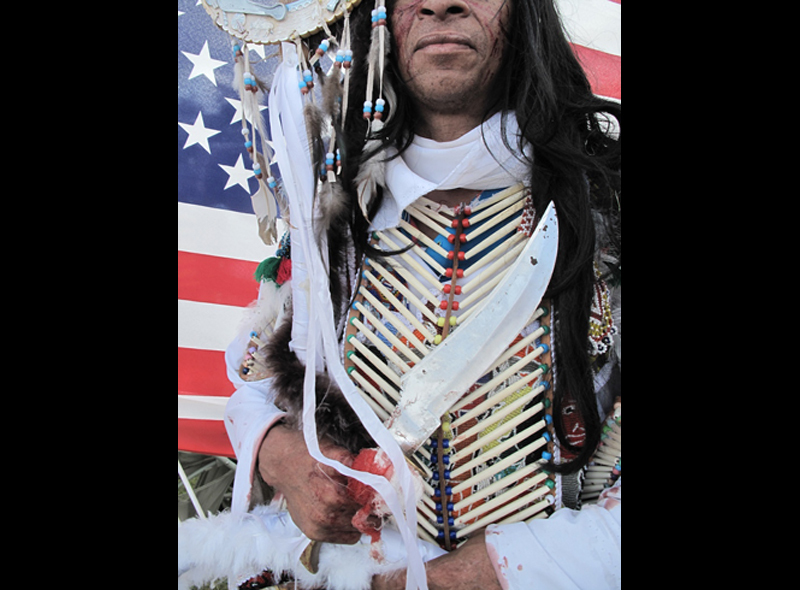 Just about the prettiest Indian in town and, "Ain't gonna to be nobody" that can touch him. 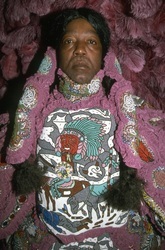 He has the power. The power of the needle and thread. 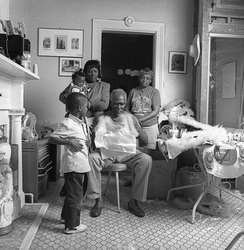 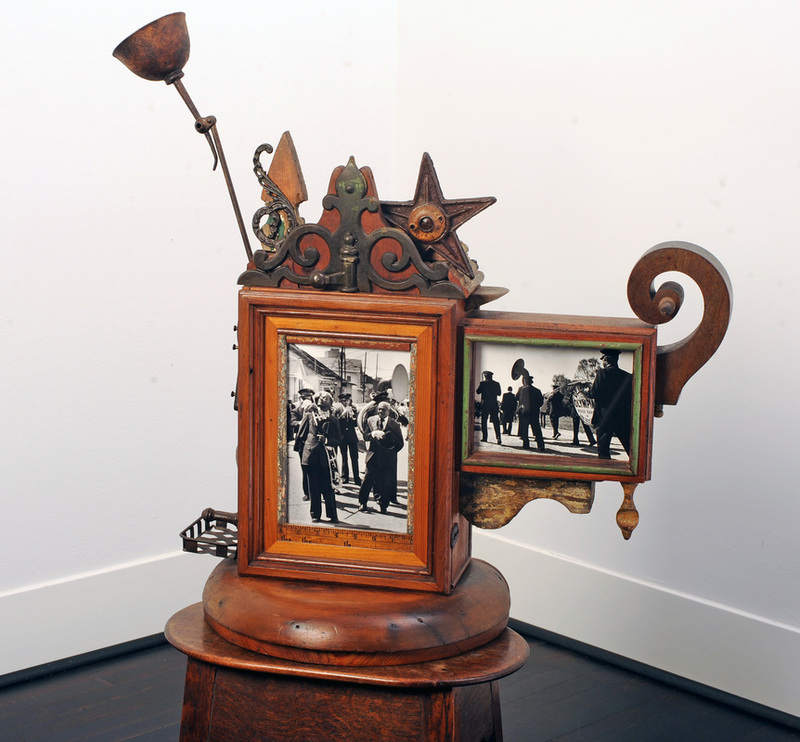 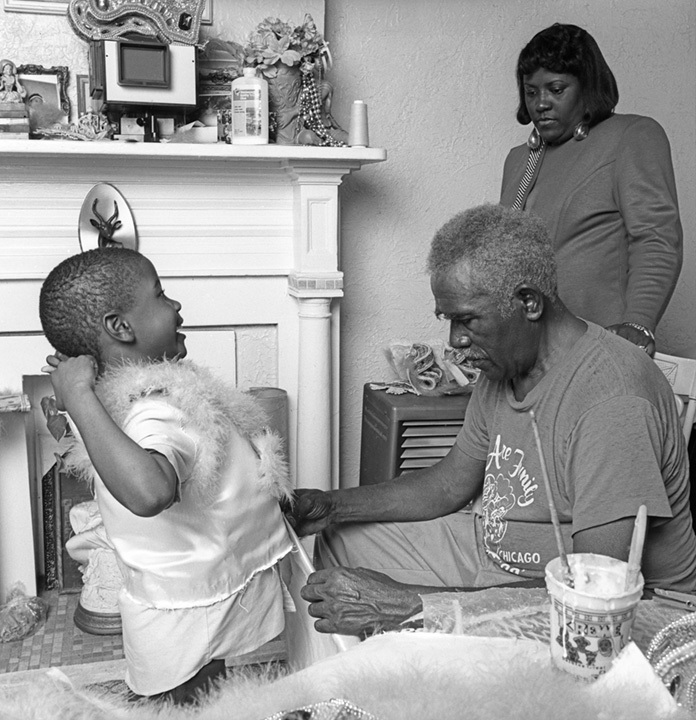 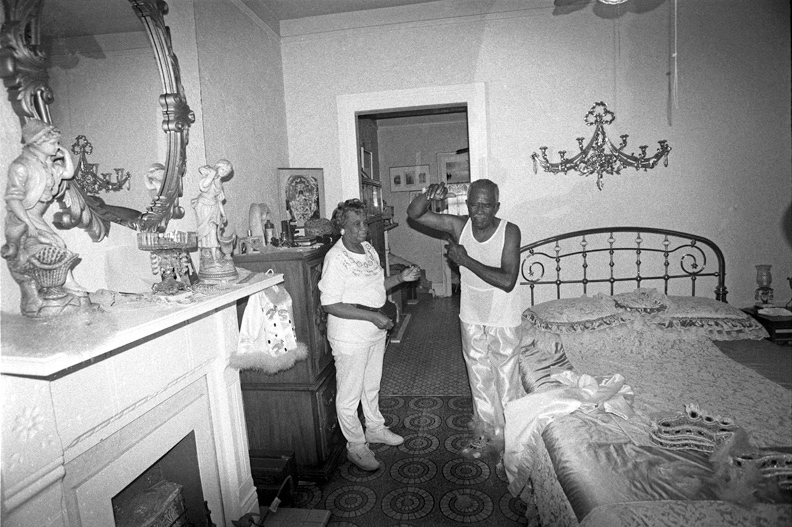 The Legacy Prints represent a curated selection of Porché West's 35-year career as a documentary and fine art photographer. 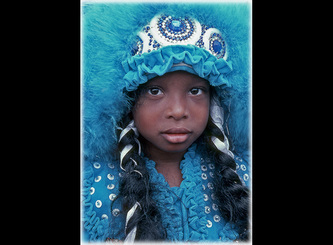 Each image is personally printed to order. 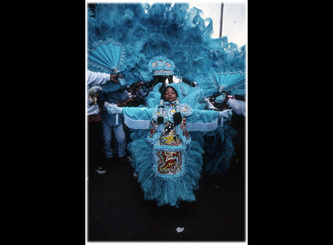 Prints are a signed pigment print with archival inks and paper. (Image size varies depending on format.) 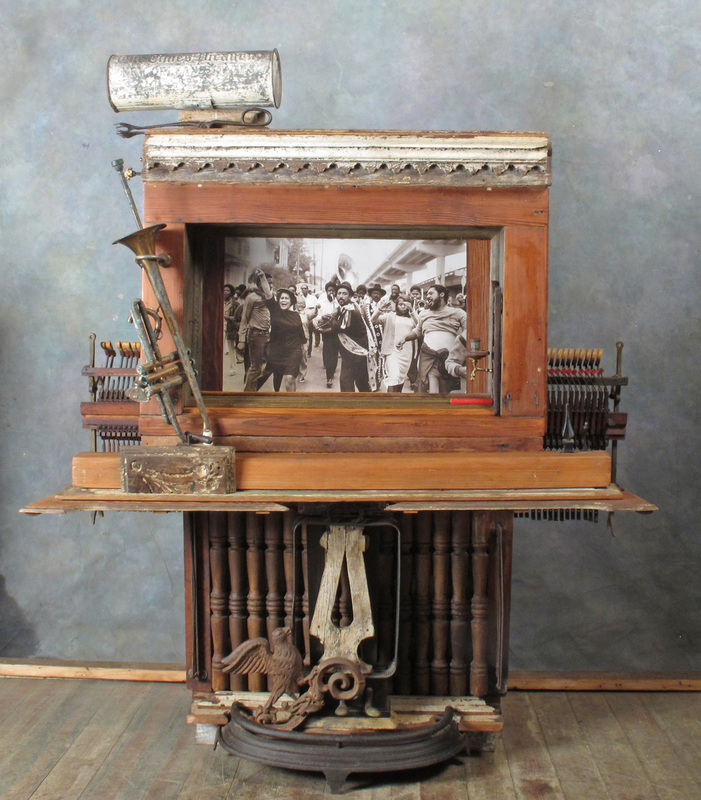 Packaged with tubed board in archival sleeve. 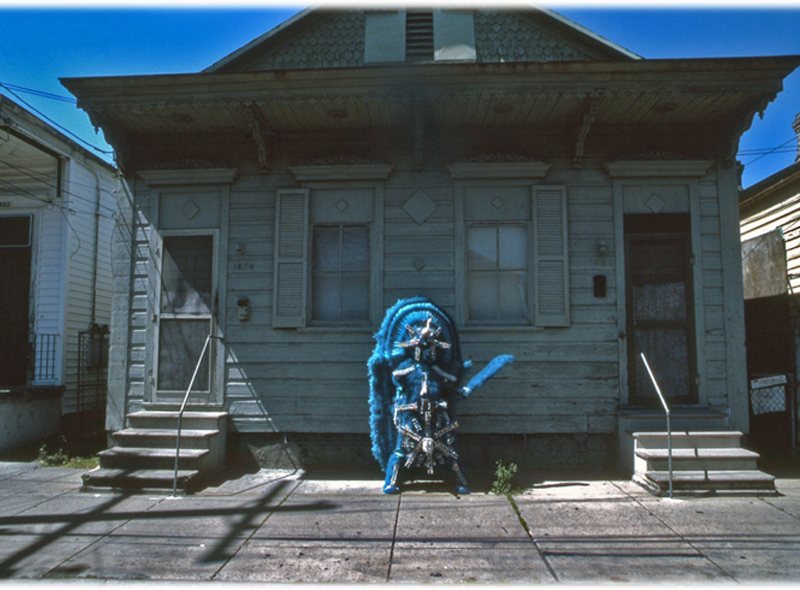 Shipped via FedEx Ground. 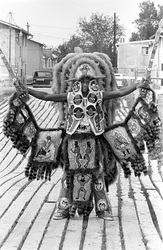 Allow 14 days for delivery. The term "pigment print" is used generally for any type of printed image that uses strictly pigments. 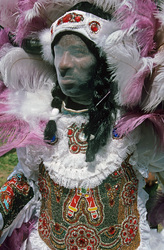 Pigment printing processes have been utilized since the middle of the 19th century. 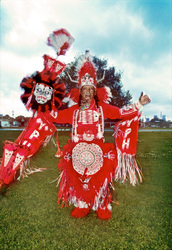 The image stability of pigment printing is superior to that of any other method of printing, including traditional silver-halide or metal-based. Considering the above factors, we define a digital pigment print, sometimes referred to as a pigmented paper print, as a digital image rendered onto an coated, natural fiber substrate with pigment inks. The quality of the giclee print rivals traditional silver-halide and gelatin printing processes and is commonly found in museums, art galleries, and photographic galleries.